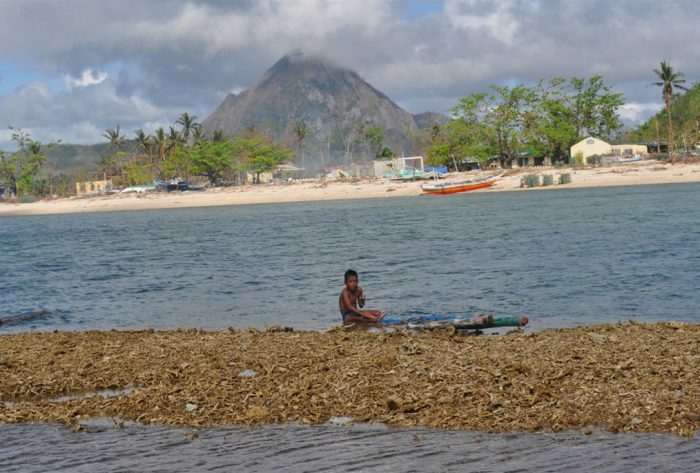 The rubble is from the damaged corals surrounding the island of Mangalabang , Concepcion. Typhoon Haiyan destroyed 100% of their coral cover. Growing up, we had happy memories of rain. You dance and sing under it, play games with your friends, and register happy memories in your brain when rainfall hits grass and soil, releasing nature’s scents. It is a bit disturbing when one sees children shiver at the sound heavy rainfall, run for cover at the grumble of thunderstorms while their elders take deep breaths and hide their fears amid rising rivers. Once, I received an SMS at 2am from a community partner who had to deal with a series of floods that engulfed homes in his community. His message read, “when is this going to stop? I do not think we have enough energy to keep battling these rains and floods”. 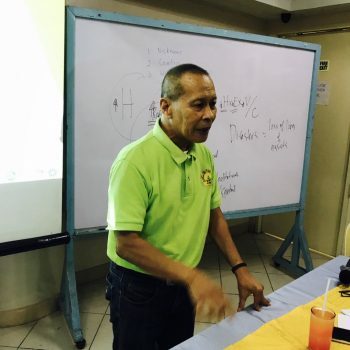 We call him Ka Noli and he comes from a community that prides itself of their disaster risk management. Ka Noli’s story is not unique. We saw the escalating challenge of monsoon rains in South and Souteast Asia this year. These are people from regions who have learned to live with floods across centuries but whose coping and adaptive capacities are no match to the wrath of heavy monsoon rains accompanying the warming of the climate. And we have not yet mentioned how much worse this can get when the rains come with tropical cyclones. Vital assets such as potable water are contaminated while homes, livelihood assets, family members, ecosystem services from vital natural resources, and intangible assets like cultural and intergenerational artifacts like pieces of art, photos, heirlooms can be swept away by torrential rains, flashfloods and debris flow. Unfortunately, for many of the communities, there is no time to adapt and, thus, losses and damage will be the consequences. What little time other communities have, they must use to enable resilient households, ecosystems, infrastructure, local economies, and social capital in the most efficient way and with innovations that are calibrated according to the power of projected climate change hazards. Sadly, many of these communities do not have access to scientific information on the hazards that they can understand. Neither do they have access to technology nor finances to enhance the indigenous knowledge they possess so they can better protect themselves — and ensure their right to life, livelihoods, social capital, history and culture and ecosystems and their accompanying services. It would be the height of inhumanity to allow these people and communities to perish and suffer damages while governments argue about who pays more, who acts first. These communities must be given a fair chance at life by allowing them access to vital climate information and science they can understand, access to climate finance and technology that will enhance their existing capacities at survival. This is breathing life into the value of compassion. Action in 2020 or 2030 will be too late for many of these communities. We must act now. There is an old saying that goes, “Justice delayed is justice denied.” Let this not be the story of our fight for climate justice. Jessica Dator Bercilla works as Senior Advocacy and Policy Officer for Asia and the Middle East for ACT member Christian Aid. She is a Fellow/Science-Policy Research Specialist of Manila Observatory and Fellow/Faculty of the Ateneo School of Government working on resilience, climate change adaptation and disaster risk reduction with various stakeholders in the region.